Wartime sitcom. The king is coming to Walmington-on-Sea. 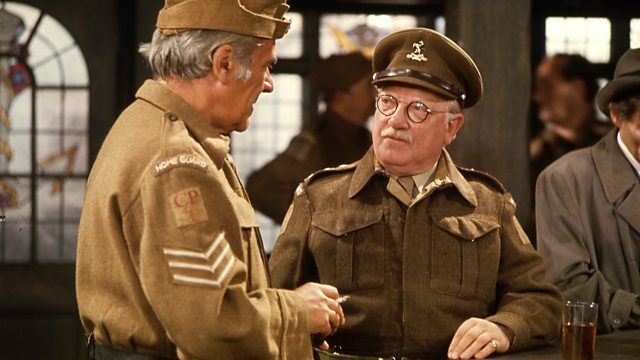 Captain Mainwaring and the platoons prepare to greet him but things don't quite go according to plan. Browse content similar to The Royal Train. Check below for episodes and series from the same categories and more! There we are, Mr Wilson. That's better. The hairiness of your serge is pointing in the same direction. -We can't have you at an important parade with your serge hairiness going in different directions. -Know what the parade's for? and we've got to look VERY tidy. -Do your cuffs up, and your collar. -I had to pop into the chemist for Mrs Mainwaring. -She can't sleep for air-raids. -There haven't been any lately. -She imagines it. Highly strung. -Slightest noise, she tosses and turns. Dustbin lid blew off last night. She went under my bunk with her gas mask on. Took me 20 minutes to persuade her to come out. Nightgown covered with fluff. I brushed it off. Terrible! Couldn't you get her some sleeping-tablets or something? -Exactly what I have done. We never had modern medication in the Sudan, sir. Only Cascara and Bicarbonate of Soda. That wouldn't help Mrs Mainwaring. No, they didn't make us sleep. Very good at making you run and belch, though. -We did a lot of that. -Do we know what the parade's for? -No, not till I've opened the sealed orders. -In that case, I'll take the Tommy gun. I haven't had it for three weeks, two days. It's my turn. -Stupid boy, look what you've done! -Look at that! All broken glass. You can't have Mrs Mainwaring eating broken glass. That could mean instant death. Ye-es... Just dust them over a bit. -Wilson, have you got anything to put these in? There may be a bottle in here. It's the Vicar's but he won't mind. -Seem to be tablets in there. -Yes. It's saccharin. Says so here. "One tablet per lump of sugar." -It won't do Mrs Mainwaring any harm, sir. It might even sweeten her nature. -Just fall the men in, will you? # Ye've never smelt the tangle o' the Isles. Oh...! -Yer tea is on the brew, sir. We've got a few minutes before I open the sealed orders, so take your tea break. Hang on, hang on, just a minute! Before you start, it's threepence a cup. Tea's hard to come by. < Hey, Joe! Before you collect the money, there's no milk or sugar. Couldn't Mike get you some? It hasn't arrived. Not to worry. Joe Walker, ye'll burn in the Devil's own private furnace! What d'you mean? Who got it for 'im in the first place? -When you've opened the sealed orders are you going to eat 'em? -So they don't fall into the hands of spies and quislings. -I volunteer to eat the secret orders, sir! -I'd consider it a great honour. -You can't say a word to 'im. -About to open the sealed orders. -Pay attention! Absolute silence while the officer opens the orders! -Don't lose that! We might need it. -Here we are. Outside, Wilson. What is it, sir? I can't stand the suspicion! Get in your place, Jones! This is exciting. Listen carefully. Listen carefully! The officer will divest himself of the secret orders. Listen carefully! ..because this secret must not be known by anybody outside this room. Understand? -In 20 minutes, a train will come through this station. -I told you it had to do with trains! -And it will be carrying... the person of His Majesty King George VI. King George VI! What's 'e coming 'ere for? The Rotary Dance is on Saturday. He'll simply be going through on the Royal Train. Camouflaged. Is the train camouflaged, or the King? I see. The train is camouflaged. Our visit has two purposes. No unauthorised person must get near the train. And we shall form a guard of honour and give the royal salute as the train steams by. This is a great honour. It's also absolutely secret. -No living soul must get an inkling. -This is not a vanilla ice. I'm very important! I'll be back in ten minutes. -How did HE find out? -Somebody told him in case of air-raids. -We'd better have a practice, sir. -Yes, all right. Good idea. That would give the game away. -We could manage here if we squeeze up close. -Yes, at a pinch. Fall in as quick as you can. -because NOBODY must know that the King is on this train. -Been one of those days! The King coming, me without a top hat, her with gravy down her tunic. Come on, I'll sponge you down. I suppose he has to be in possession of all the facts. -ALL: One, two, three, one, two, three. Pike, you know you can't present a Tommy gun. -What shall I do, then? -That's right. And take that silly scarf off. -I don't think I'd better. Me mum said I looked peaky. -One, two, three, one, two, three. Try and keep up with the others, Jones. Present arms. -1, 2, 3, 1, 2, 3. I can't just stand doing nothing. The King will think I'm rude. -Could I show it to him, then, like that? -Get back and stand to attention, Pike. I feel such a fool, that's all. I'm at a dead end, too. D'you think I ought to wave? Silence in the ranks! Slope arms. Pike! Pike! Any more trouble from you and I'll take that gun away and send you home. Some of the trains pass at 60 mph. By the time we've presented arms, the King will be nearly at Eastgate. Quite right. You've got to do it very swiftly. Imagine you spy the train coming. Present arms! 1, 2, 3, 1, 2, 3... There goes the King! Slope arms! 1, 2, 3, 1, 2, 3... Something like that, sir. -I think Jones and Walker have quite a good idea there. We'll have to have two versions of it, won't we? The slow present and the quick present. Let's try it. Quick present...arms! No precision there at all. Slope arms again. -Have we...have we missed him? -I represent the church, and the Mayor represents the council. I represent the ARP. And I'm a sightseer. -No sightseers on the platform. -Why not? He's just as much MY king as he is yours. -Good heavens! He's here already. Outside. Line up on the platform. The King's coming! Don't panic! The King's coming! -That's it. Quick as you can. Dress by the right. -Dress by the right for the King! Ahem. Here it comes. Right! Chins in, chests out! -We'll do the slow present arms. Pass it on. -Slow present arms. Pass it on. Pass on the slow present... gonna do the slow do. One, two, three, one, two, three, one! I think it's going to stop, sir. I think it IS stopping, Mr Mainwaring. Stop talking in the ranks! Hold the present! Go and get some red carpet. -Where am I to get red carpet? -Just do as you're told. Get some! Doesn't look like a royal train. Perhaps it's camouflaged. War or no war, it's a disgrace! Complain to Steam Maintenance. I'm going to. 'Ere, see if you can squeeze one out of that pot. I'll give 'em an earful. Look at it! Hardly any grip. Couldn't you pack it with paper? You don't pack steam brakes with a bit of paper! Hello? I want George Martin at once on this phone, in person! They've used up all the sugar. Eh? "Saccharin." Eugh! Ever tried it? No, no. Better than nothing. How many lumps? Four. Same as me. What's it say...? "One tablet for each lump." Excuse me... You don't happen to have a piece of red carpet, do you? A few feet would do. -Didn't think you would. Thanks awfully. Hello? Is that you, George? George, Henry Burstall here. You know the square boss on the steam brake wheel? It's round! -Captain Mainwaring, I think this is a rum do. -The King wouldn't travel on that. It's too scruffy. -Perhaps it's part of some master plan to which we're not privy. I'll see if I can find an equerry. Your Majesty, are you there? Are you there, Your Majesty? This is the best I could do, sir. What's all this rubbish doing here? It's the Snettlefold stopping train. The King's not on THAT! Who left it here? -The driver. He went in the office. -I bet it's that Henry Burstall. Henry, you're stopping the King! -Get this lot on to the siding! Henry! Give over snoring when I'm talking to you. The bottle's empty. They must have swallowed all the pills. -The King can't pass while that train is stuck. -With 2 elephants! I can drive it. -Better get Snettlefold to send a driver. -That'll take half an hour. -Shall I get my sister to put the kettle on? I can drive it! -I learned at the Schoolboys' Exhibition. It's easy! This is Walmington. Can you send us up a driver? What's happening? I'm asking for a driver. Mainwaring's shifting the train. I've no time for argy-bargy! -No need for us all up here. Away, man! I wouldn't miss this, not for £3! You'll need me to change the points at the siding. -Right, off you go, Pike. -Aye, aye, Mr Mainwaring. Full steam ahead. -I can't help feeling it's not an awfully good idea. -Stop being a wet blanket. Get some coal on. -We're on the shift, sir! -Do we have any tongs? 'Ere! Where are you going? I told you! Come back! Stop! D'you think they'll need this? That ought to be on the brake. What are you doing with that? Don't push me! He pushed me! Stop bickering! Is it important? Without it, they can't stop. After them! I'm enjoying this, Mr Mainwaring. -You know, Wilson, I've wanted to drive a train since I was a small boy. -Give it a bit more, Pike. -Captain...the Warden, the Vicar and the Verger are chasing after us like mad things. -Should be a little wheel there. -Never mind the technical details. -I can't, can I? That wheel's the brake. -You said you knew how to drive this thing. -I can't stop it without a brake. -Don't use that tone to me! -That'll make it go faster! -How DO we stop it? WE CAN'T STOP THE TRAIN! DON'T PANIC! We'll never catch them like this! They can't stop without this wheel. Give me a hand. If we turn the power off, surely we'll stop. -Yes. Turn the power off. -Wrong way. You'll make it go faster! No good. We'll freewheel. It's downhill all the way. Suppose there's a train ahead! Look, look! The Warden is following us on a wee bit bogey. Look! He has the brake wheel in his hand! If there's another train and we run into it, dozens will be killed and injured. -I'll work my way back and get hold of that wheel. -Then I'll go over the roof. -I can't let you go on your own, sir. I'm coming to assist you. -You're in charge now, Wilson. don't you think you ought to have a scarf? There's a chilly wind. Come on, put your backs into it! Don't push me! He pushed me, Your Reverence. Captain Mainwaring, you'll be safe if you hold my hand. -No, sir. Where you go, I go. It's very slippery, isn't it? Someone ought to tell them. It's not very nice for people walking along, and it's sli... OOH! Oh, sir...you saved my life, sir. I'll never forget that, sir. Thank you, sir! -Don't go near the edge. Just keep pumping. If we get close enough, I'll chuck it. Keep pumping, and I'll chuck. -Well caught, Mr Mainwaring. Now get it to the end that puffs. Right, you can ease up now. Frank, I've been thinking. That great big lever must do something. -Oh, yes. That makes it change gear, go faster. Or go backwards. Couldn't we put it into reverse and that might stop it? I suppose so. -Or it'll make it blow up. -If we're going to hit that train, we ought to try. Mr Mainwaring...oh! You saved my life again, sir. -Where would I be without you? -What the hell are they doing?! -I think it's stopping, Uncle Arthur. I think they're stopping. They can't have got the wheel back yet. They're stopping anyway. Perhaps they've used another lever. You're right! They've used reverse. They're coming towards us. Are you sure? Of course I'm sure. Get pumping! Snettlefold should have seen them. Perhaps they've stopped. How can they without the wheel? TRAIN HOOTS Blimey, they're coming back! Get them into the siding. Do be careful, sir. It's dangerous. There's the wheel, Pike. Fix it on! LOUD WHISTLE > Blimey, that'll be the King! Come on! You ruddy hooligans! You nearly killed us. It's quite possible that he HAS. -The King's coming, Mr Mainwaring, the King's coming! -All right, lads, smarten yourselves up. That's where the engine picks up water. They drop a scoop down and spray flies everywhere. If we stand here, we'll be soaked. Yeah! -We'll get all WET, Mr Mainwaring! Drop of rain won't hurt you, boy. Royal Salute. Present...arms! Classic wartime sitcom. The king is coming to Walmington-on-Sea. Captain Mainwaring and the platoons prepare to greet him, but as usual things don't go quite according to plan.